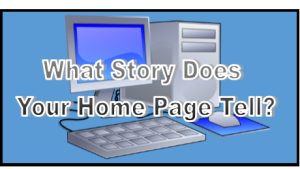 What Story Does Your Home Page Tell? There’s no “right” look for a law firm website – but there’s one thing yours should do, or you might as well take it down. It should tell a story. The goal of the story – like all stories – is to engage the reader. The setting is your law practice. The plot should be clear, interesting and compelling. And here’s the most important thing. The protagonist of your website story is not you, and it’s not your law practice. It’s the person visiting your website. Many lawyers don’t get this, and it’s easy to understand why. It’s their site after all. They’ve paid good money for it, and they want a return on their investment. So their site becomes all about themselves. It tells a story of their great deeds, and how wonderful they are, and why you should choose them over every other attorney in the world. And while there’s nothing wrong with this story – in fact, it’s an important subplot – it misses the main point. Which is to bring the reader into the story – and by extension, into your law office. All good stories have a strong beginning. In website parlance, that means your home page. This is where online searchers are likely to meet you. How to hook them? With images, of course. We live in a visual age. Your website is a picture book, not a textbook. The modern trend is to anchor your landing page with a clean, powerful image. It stretches the width of the page and is fully responsive – meaning it looks great on screens of all sizes, from phones to desktop monitors. Recently I helped a firm located in the mountains revamp their website. We chose a home page photo of the gorgeous rolling vista that surrounded their office. Another example is this award-winning site for Hutchison PLLC – designed by New Media Campaigns of Carrboro – which adds an artistic touch to a city skyline. The imagery can be a video slide show or a stylized logo. It can illustrate what you do. It can be specific or abstract. For my home page, I chose a photo I took myself of the sundial at Morehead Planetarium. The image has a sturdy “legal” feel. Through it you can see signs of everyday life: cars, flowers, a church in the background. And it pinpoints where I’m located: in Chapel Hill. Words can also grab a reader’s attention. They should mesh seamlessly with the visuals. These two elements work together to tell your story. Consider coming up with a tagline for your home page. Taglines are sometimes called straplines, kickers and slogans. They can describe your practice, summarize your philosophy or simply entertain. Here are some of the great taglines in advertising history: Good to the last drop, Fly the friendly skies, Have a Coke and a smile, Just do it, A diamond is forever, Where’s the beef. Don’t try to be clever when coming up with your tagline. Cute is fine for selling coffee or hamburgers, less so for legal services. And above all, be brief. Online visitors spend three to five seconds on a website before deciding whether to exit or click further. Grab them with stellar words and images on your home page. What elements do you find effective on websites?